Today’s blog is one in a series on the Luxury Charter Bus Industry. Whether you are interested in booking a daily charter or a multi-day tour, this blog series will offer you the tips and destination ideas that will make your next charter the best experience it can be. If you want to book a Luxury Coach Bus for your next Charter, call 610-222-6225 and speak to a Kevin Smith Transportation Group Tour Operator who can assist you with everything from vehicle selection to designing your entire tour. Snow is coming. The Farmer’s Almanac prediction is for a colder winter than usual with big periods of snow, especially in November and December and early March! That’s not so good for heat bills, commuting to work, or tailgate parties outside. But we know one contingent that loves this stuff, SKIERS!!! We know how much the winter sport folks of all ages like to slide down hills on skis and snowboards. One thing, however, that is not as much fun is all the driving to and from the slopes. They are usually a good distance away from where you live, and to get a full day in on the mountains, it is necessary to get up really early and get on the road. On the return trip home, after countless runs, up and down, twisting and turning, it is often even more challenging to go to the parking lot, scrape off the snow and ice from your car’s windshield, get in the cold vehicle, and make your way down the country roads and highways on the long tired way back to your home base! 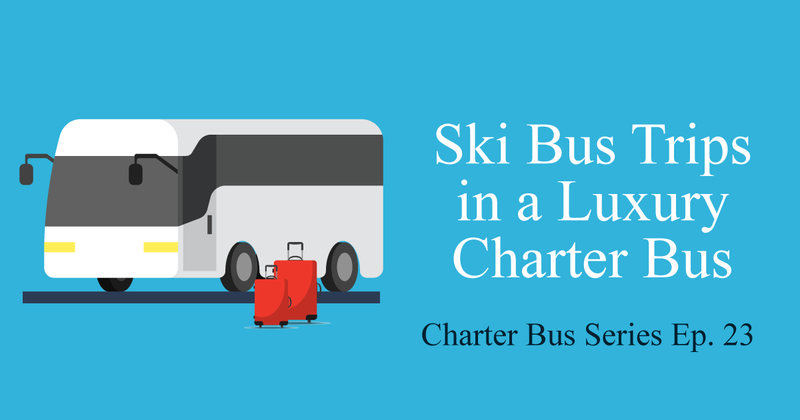 So there is one word for you – SKI BUS CHARTER!!!!!!! You get up in the morning, and you are already all packed up and ready to go. You get dressed and out the door, grab a hot coffee and the breakfast sandwich of your choice along the way, and take the quick drive to the local pick-up point for your modern and comfortable tour bus charter. All your ski buddies show up too! Families, kids, however you want to do it. All your gear fits easily into the outside luggage compartments while you settle in to your seat in the toasty warm cabin, finish your coffee, shoot the winter breeze with your ski pals, recline a bit, watch a movie, re-tell all your favorite ski adventure stories, watch the winter wonderland scenery go by, and perhaps doze off for a while until your body clock wakes you up when the charter turns into the entranceway of the ski slope of your choice. You’re there! Refreshed, relaxed, excited and ready to hit the ski trails! Is there a better way? No, there isn’t! After the perfect time skiing, taking all the runs downhill that you dream of, when it is time to call it a day, you gather up your stuff and just walk over to the parking lot where you will find your new best friend, a luxurious, heated charter tour bus with a professional driver. They will take you and your party back to your own neighborhood. You stretch out, lay back, peel off the layers, and recount the day with all your friends. If you all want to sing the theme for Gilligan’s Island, The Flintstones, or act out Lady Gaga’s new single, it’s OK, in fact (almost) encouraged! You certainly don’t have to read directions, watch out for speed traps, or find a gas station. If you and your contingent wants, it can be planned to stop for a wonderful and memorable dinner together as part of your itinerary. Of if you want to just pull into the local McDonald’s to get super-sized orders of fries for everyone, that is very doable as well. Just know that the bus may not be able to navigate the drive through window! Treat yourself and your friends, your group or your family to a fun and easy day, skiing together, traveling together, talking, laughing and enjoying each other’s company. Get your basic ski trip ideas together and a tour bus company representative can assist you in filling in all the details of your trip to one of the great North East ski slopes. Do you know what is waiting for you? You can even book a multi-day excursion to a variety of your desired ski slope destinations. Simply identify your destination resort or resorts and let us help you plan out the perfect ski trip. Thank you for reading today’s blog on the Luxury Charter Bus Industry. Please visit us every week as we share tips, explore industry news and suggest tour destination ideas for those that are interested in booking a Charter Bus Trip.